I have several links to share. A couple of libraries have appeared to simplify writing applications that use WebGL: C3DL and WebGLU. 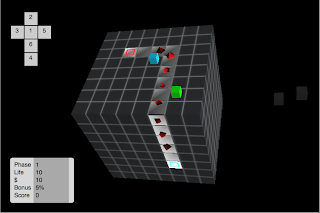 C3DL has been around for almost 2 years now and has recently been ported to WebGL. A demo of the port is here. Since there isn't any real documentation on WebGL so far, getting even this far takes some digging and patience. Giles Thomas created a blog about WebGL with very detailed lessons based on the NeHe OpenGL lessons. Giles updates pretty regularly with new lessons (7 so far!) and demos. He also fairly impressively stays on top of other new demos and WebGL things so his blog is good to watch if you're interested in WebGL. The previous warning still applies: WebGL is still changing. Until the spec is finalized, lessons and demos are likely to break. Expect some updates on this in a few weeks. 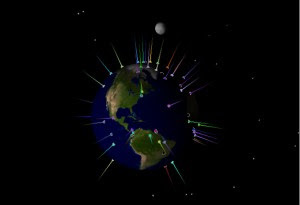 While Giles does a pretty great job of collecting links, Chris Blizzard set up a planet site for WebGL which includes his and other blogs of people posting about WebGL. If you know of someone else or are someone with a blog about WebGL, let Chris know and get it added to the site. For anyone following the attempts to bring 3D graphics to the web, the announcement by the Khronos Group of the WebGL working group was very exciting. The Khronos Group is the body that inherited the OpenGL standard from the OpenGL ARB. OpenGL has been around for 17 years. It is older than the Web. Not only has it been around, it's current. Everyone knows that if you want to do cross-platform hardware-accelerated 3D graphics on your desktop, you use OpenGL. If you ask the same for the web, there hasn't been a good answer. WebGL will hopefully fix that, taking advantage of the ubiquity and popularity of OpenGL in a way that fits the web. And it's coming soon. The WebGL working group is targeting the first half of 2010 for release of the standard, but implementations will show up before that. The canvas3d prototype has been around for 2 years and gives a peek at what to expect, though it's different in the details. The WebGL spec is not final yet, but Vlad's work is a head-and-torso-start. He's been updating it to match the spec, but recently I've taken this over to keep things moving with the spec. I'll also be looking at performance. Manipulating large amounts of native data, as needed for OpenGL, can be made much faster in JS. I'll be posting updates about my progress soon.